The Sikh Times - Biographies - Jagjit Singh Chauhan: "Khalistan Will Be Formed by 2007"
Jagjit Singh Chauhan: "Khalistan Will Be Formed by 2007"
Once self-proclaimed president of Khalistan, Dr. Jagjit Singh Chauhan, after winning a long legal battle has returned to India and has since been living a life of solitude. To catch him on the 20th anniversary of the Operation Blue Star, we walked into a hospital, anticipating arrogance and hostility, what greeted was a warm smile and cup of tea. After waging a war against India, which he calls an artificial nation, Jagjit, 76, now wants to be a selfless worker for Khalistan. From the heady days, Jagjit now tends to patients that come to his charity hospital in Tanda in Hoshiarpur district of Punjab. 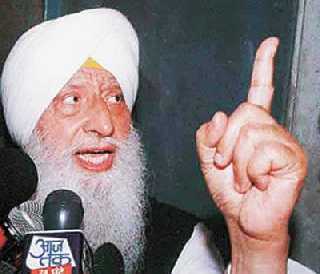 Heading the Khalsa Raj party, he is supported by parties like Dal Khalsa and Khalsa Conference. He claims he never was a part of the armed struggle led by Bhindranwale and never propagated self-determination by the weapon. In India, he is taking up the cause in a peaceful and democratic manner. Jagjit, who was once chased by the intelligence units and labelled anti-national, is now waiting for the end of his life. To give meaning, he decided to serve people, but his heart aches for the land of his dream, which he believes will happen by 2007. On top of his hospital, the Khalistan flag unfurls and so do his dreams about an independent Khalsa land, Khalistan. M.K. Tayal: What are you doing these days? Jagjit Singh Chauhan: I run this charitable hospital. I serve people and take care of them. I have donated this land to the hospital that I had earlier rented out. But then I found that the doctors I had rented the place to were charging exorbitant amounts. So I decided to step in. M.K.T. : This hospital looks new. J.S.C. : Yes, I am still constructing it. It will have 30 beds, an operation theatre and labs. The land is around eight acres and costs nearly Rs. 100 crore. Local mafia tried to grab it and now I am fighting a court case against them. M.K.T. : What about your movement, Khalistan? J.S.C. : The movement continues. Violence was injected by the Indian intelligence agencies. Bhindranwale was surrounded by agents. The Indian government wanted to curb the movement, so they knew it would be finished by the gun. But how long can violence last? See Sri Lanka, Palestine, Nagaland. There is no end. M.K.T. : But why come to India after all that? J.S.C. : In London, I was leading a comfortable life. But then I didn't want it any more. I had free rail passes and accommodation. They even gave us a room in the Parliament. But the real movement is the Khalsa movement that was started in 1699. M.K.T. : What was the impact of Operation Blue Star? J.S.C. : Bhindranwale was in the right. He was a preacher. The army should not have attacked the Darbar Sahib. M.K.T. : Now what do you plan to do? J.S.C. : See one day, India will be the United States of South Asia [U.S.S.A.]. It will have Afghanistan. Pakistan will break up into five parts and be a part of U.S.S.A. And so will India. Bangladesh will also join. Nehru wanted to be king. He virtually became king. He divided the states too. M.K.T. : Do you think people want Khalistan? J.S.C. : Every Sikh wants it. They may not admit it. But that is a fact. Is it alive and how strong is the movement today? Very much alive. We have chapters in London, Washington, Canada. We have a radio station and even a T.V. channel besides websites. M.K.T. : What is the difference between these chapters? J.S.C. : Style of working. Washington wants a hi-tech office. It is modern. M.K.T. : Is the U.S.-based Dr. Gurmit Singh Aulakh the president of the Council of Khalistan? J.S.C. : Yes! I was the president but now, I want to be a simple worker. M.K.T. : What happened to the currency of Khalistan? J.S.C. : Oh! That was symbolic. It is still present. It was started to pressure the government. M.K.T. : What do you see as the future? J.S.C. : I will not stop talking about Khalistan. After Operation Blue Star, I said Indira Gandhi would not see 1985. She was killed before 1985. It came true. Then Prime Minister Chandrashekhar met me in London. I told him Rajiv Gandhi would also be killed. Ten days later, he was. What I say is with a lot of intuition I use it in politics. Now Khalistan will be formed by 2007. M.K.T. : How will it be different from India? J.S.C. : It won’t have corrupt people like Laloo Prasad Yadav or the Jan Sangh (B.J.P.). India is an artificial country. M.K.T. : What about Manmohan Singh? J.S.C. : He is an honest economist but how long will he last in the system? Khalistan will have local-level bodies and no S.P.s and D.M.s. These village councils (Khalsa panchayat) would also perform the duties of the courts. M.K.T. : Has the recognition by the Unrepresented Nations and Peoples Organisation [U.N.P.O.] at the Hague given a boost to the movement? J.S.C. : Yes. Apart from that we already have three-four M.P.s in the British Parliament. Kashmir has four-five M.P.s. Our movement is coordinating with the Kashmiris.